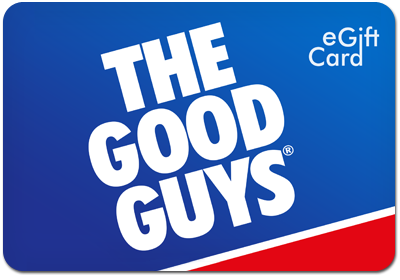 The Good Guys gift card can be used to shop at any of The Good Guys stores, or up to two gift cards can be used for any online order at www.thegoodguys.com.au. KEY TERMS AND CONDITIONS OF USE: Thank you for selecting The Good Guys eGift Card. This card can be used online or at any of The Good Guys Stores in Australia. For online purchases simply enter the card number and PIN number displayed on this eCard. For in store purchases print out this eCard and take it into any of our stores where you will find over 200,000 items available to purchase. This eCard does not expire. Full Terms & Conditions, and balance checks can be accessed at www.thegoodguys.com.au/giftcards. For other gift card assistance, please contact 1300 554 268. We hope you enjoy The Good Guys eGift Card. Gift Card Services powered by Vii.